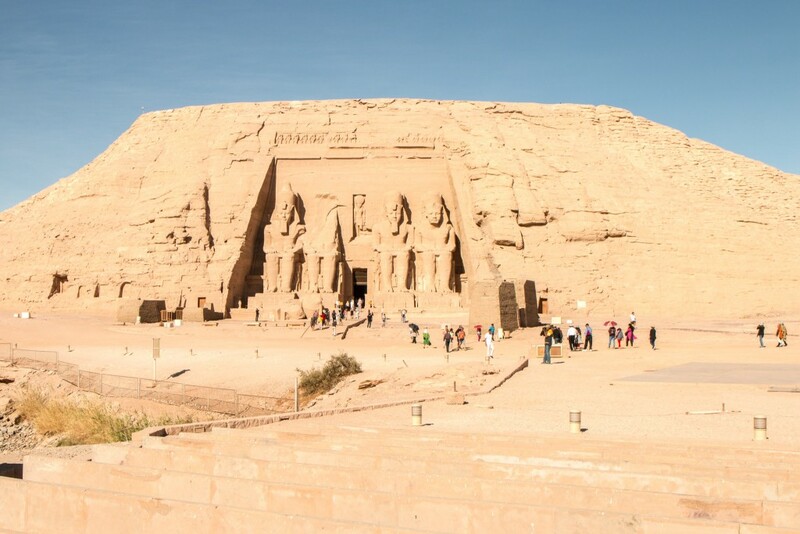 After the first couple days in Cairo, our trip in Egypt continued south to Aswan. 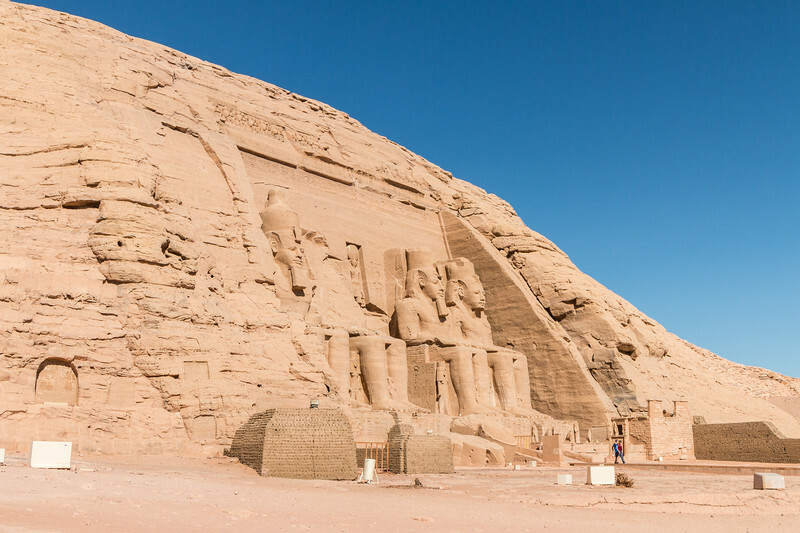 Our goal for the stay in this region was to explore the sights of southern Egypt, including Abu Simbel. This journey ended up being a remarkable 12h sleeper train ride, something we had never done before! 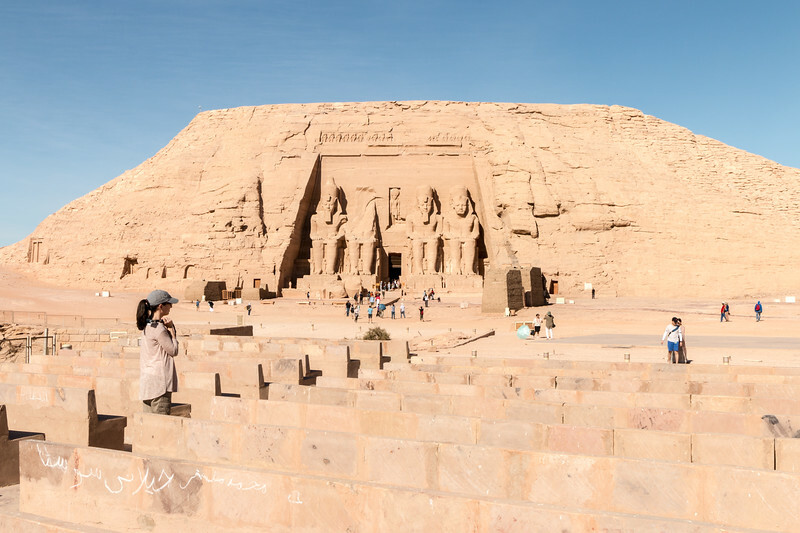 Abu Simbel is the location of two incredible rock cut temples created during the reign of Pharaoh Ramesses II (13th century BC), in his honor and queen Nefertari’s. 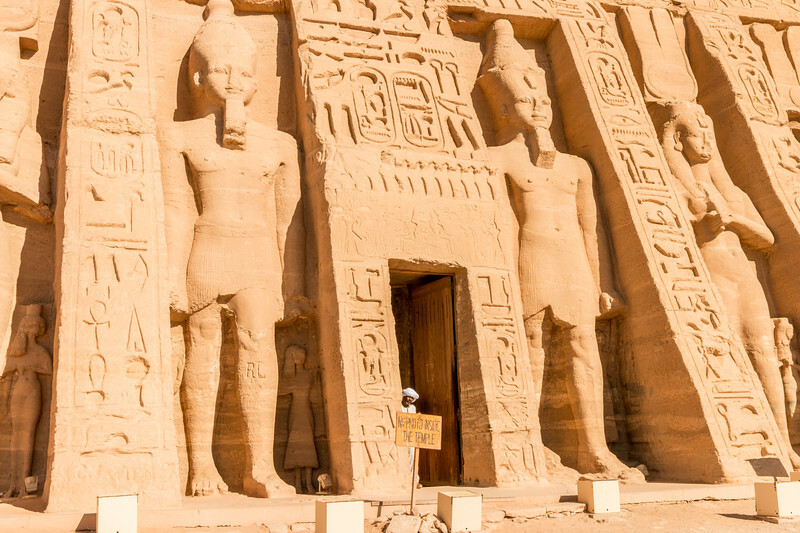 They are simply known as Abu Simbel temples and are part of a UNESCO World Heritage Site. These temples are located deep in the south of Egypt, on the banks of lake Nasser and very close to the border with Sudan. 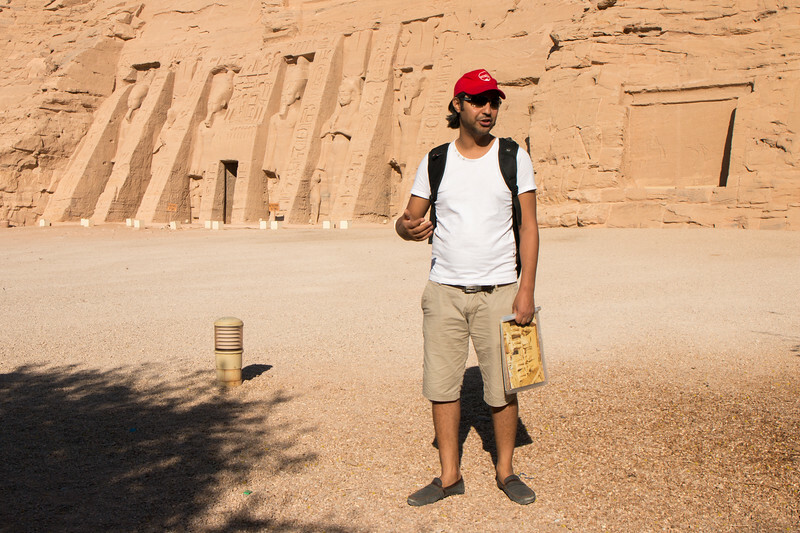 To reach Abu Simbel from Aswan, a 3h and 300 km drive through the desert is necessary. Now to the fun part. A 3 AM wake up call! 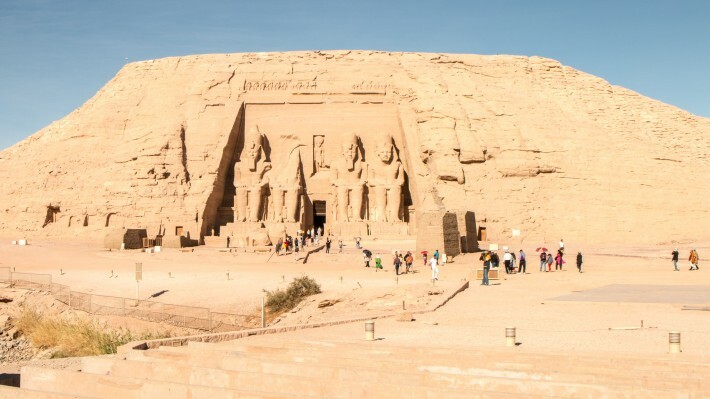 Traveling to Abu Simbel is done as part of a police convoy, whether on a bus, van or car. This is a requirement for all tourists due to security concerns. 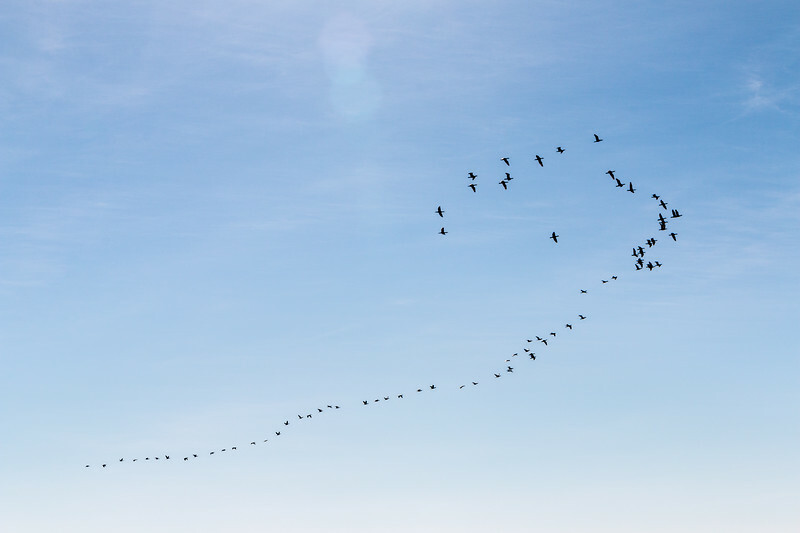 Two convoys depart daily at 4 am and 11 am, and return at 9 am and 4 pm. The trip itself is very uneventful. The pain of a very early wake-up and a (not very good) breakfast box is only relieved by the first glimpse of the sunrise, for those who manage to stay awake. The convoy was far less exciting than expected. Heavily guarded police shoot off at high speed to sweep the road and probably get to Abu Simbel a good half an hour before everyone else. All safe, though! 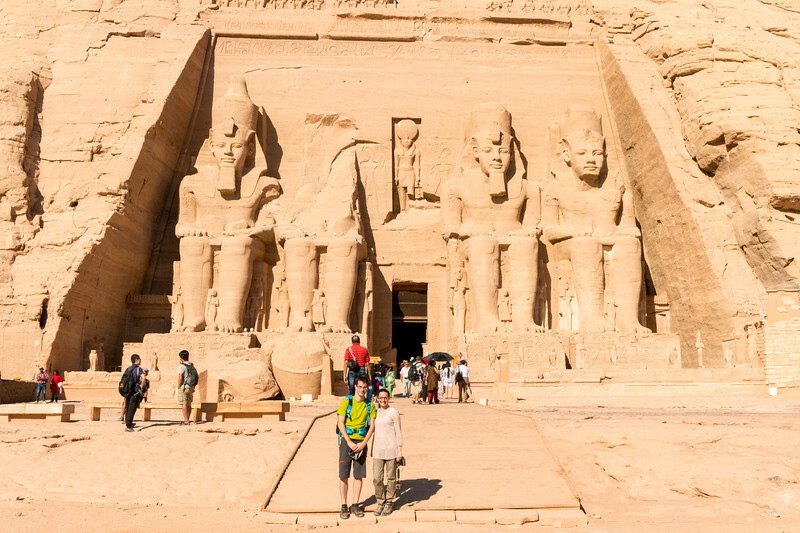 Virtually all tourists travel to Abu Simbel on a day trip. Flights from Aswan are also available. Yes, you’re reading it right. 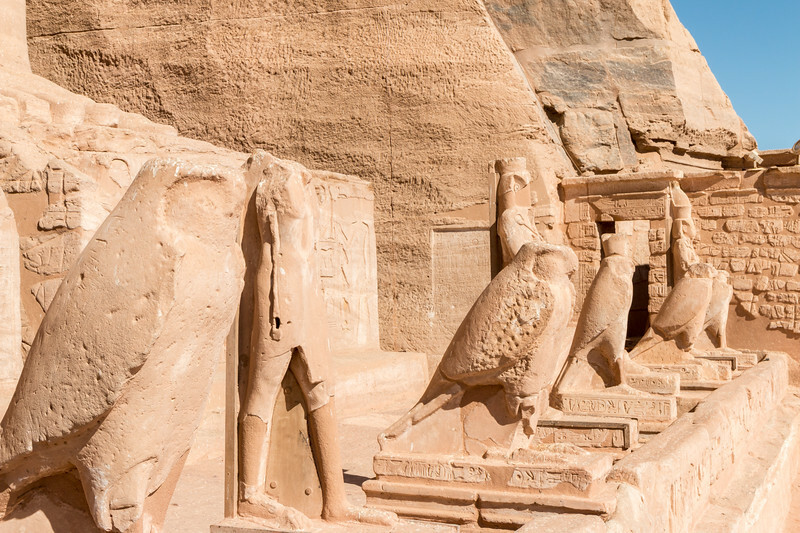 The temples at Abu Simbel were relocated. As in, they were moved piece by piece from their original place to where they are now. Before we talk a bit more about it, here are two pictures of the temples to make you think about this astonishing accomplishment. Our guide explained to us why and how this was achieved. The construction of a new and important dam in the Nile (Aswan High Dam) would put at risk Abu Simbel temples due to the rising waters. With this in mind, a campaign was created in the 60’s by UNESCO to save the Nubian sites in the region, including Abu Simbel. From 1964 to 1968, both temples were cut into exact and precise pieces, lifted and reassembled in the new and safe location, 200 m back and 64 m higher. This was one of the most important and challenging archeological works of all time. Millions of dollars were spent. But that’s not all. The temples were originally cut into the face of the mountain, so a fake mountain had to be built to replicate the exact same thing. Even the orientation is the same! The original site is now underwater of lake Nasser. The temple of Nefertari is known as the Small Temple. Nefertari was one of the best-known queens and certainly a favorite of Ramesses since he dedicated this temple to her. The temple is also dedicated to the goddess Hathor. 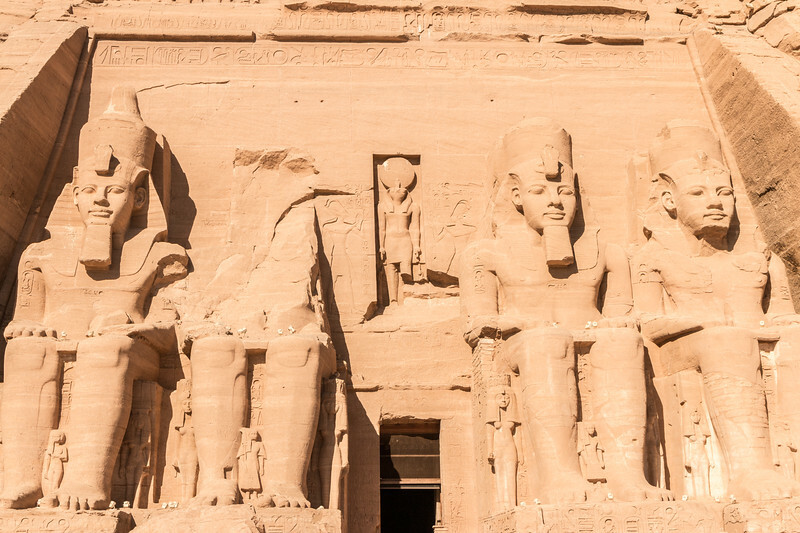 The facade consists of 10 m high statues of Ramesses II and Nefertari. Apparently, this is highly uncommon, since female statues are usually much smaller. This reveals the importance of Nefertari. 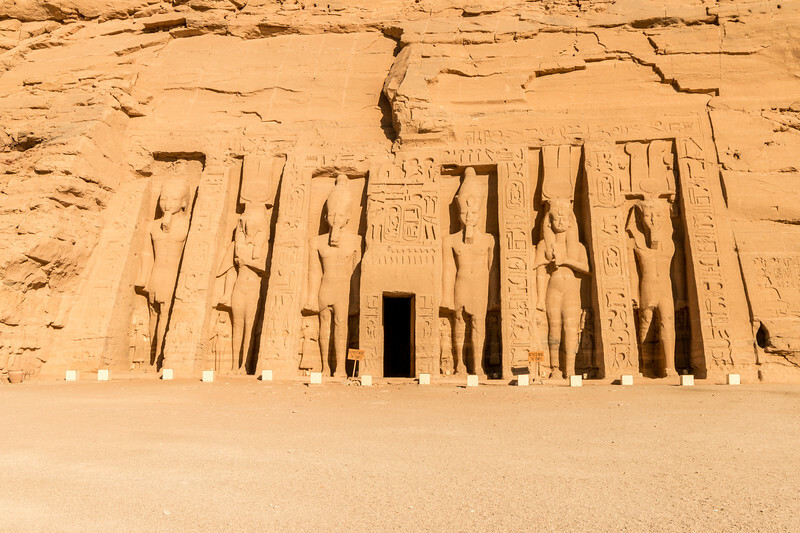 Inside this temple, the walls depict offerings to the gods by Ramesses and Nefertari. 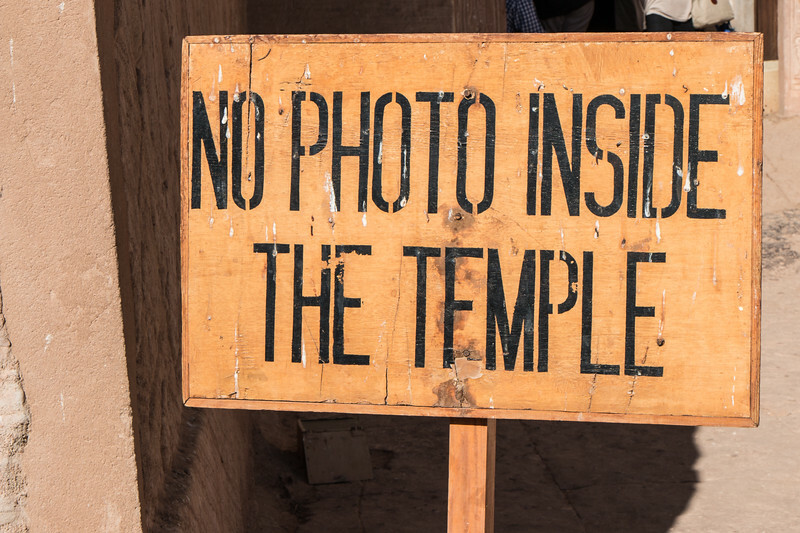 Unfortunately, photography is forbidden inside both temples, which is a shame, because the interiors are truly magnificent. The temple of Ramesses II is known as the Great Temple. Colossal is probably the right word to describe it. This temple is dedicated to Ramesses himself and also the gods Ra-Horakhty, Amun and Ptah. The facade features four 20 m high statues of Ramesses II, of which one is badly damaged, and other smaller ones from his wife and children. Once inside, one can tell how big the temple really is. In the hypostyle, massive pillars in the shape of Ramesses as the god Osiris support the temple. 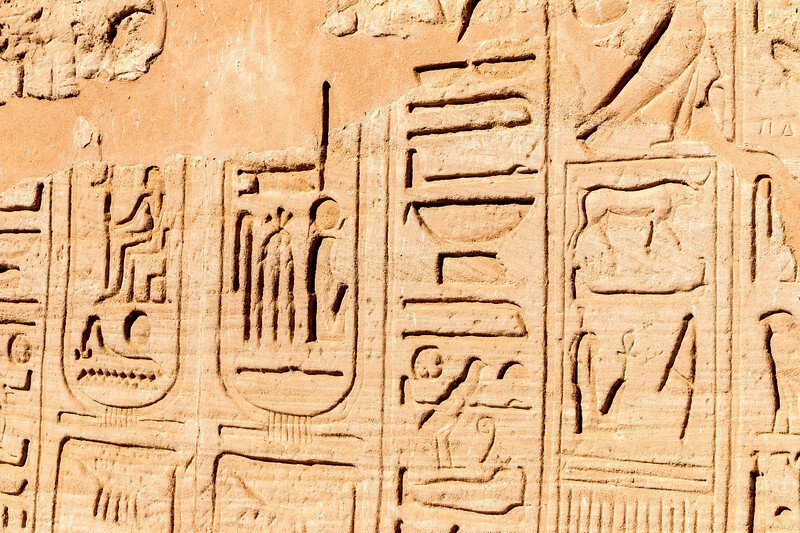 The engravings depict Ramesses II paying homage to the gods and the battle of Kadesh. Ramesses considered himself a god! Plenty of side rooms allows for some time of exploration. The orientation of the temple was an important aspect of the relocation, as they intended the sun rays to enter like they did originally. Twice a year, the rays illuminate the back wall of the temple, where the sculptures of the gods are. Guides cannot go inside and it’s quite hard to really understand what’s going on with all that is written and engraved on the walls. A bit overwhelming, to be honest. 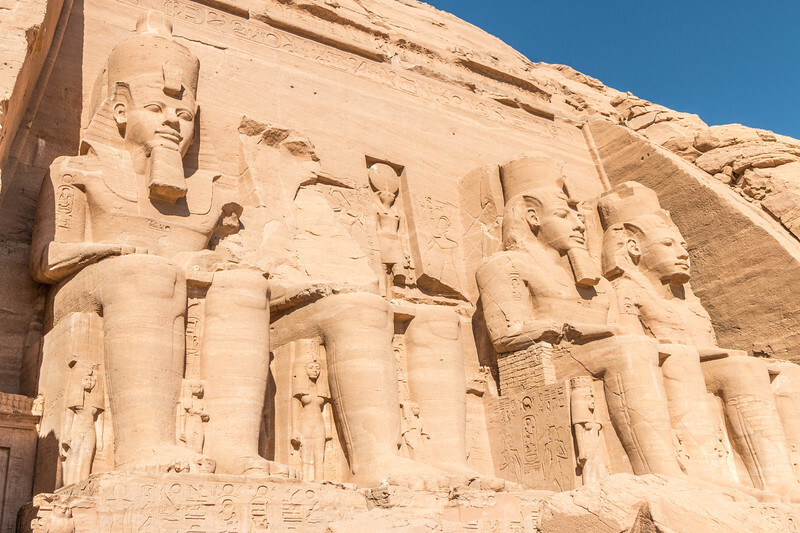 Abu Simbel is without a doubt one of the most spectacular monuments we saw in Egypt. And it’s quite unique too. It reminds us of Petra due to the way the temples were built. We’re very glad we didn’t research much about the place before our trip so we could admire it properly. As you can see in the pictures, there’s barely anyone there. Besides being very far from other main areas in Egypt, the current situation in Egypt is not helping tourism. Again, our visit was trouble-free, like the rest of the trip. Bonus tip. If you’re staying for the night, there’s a light and music show. 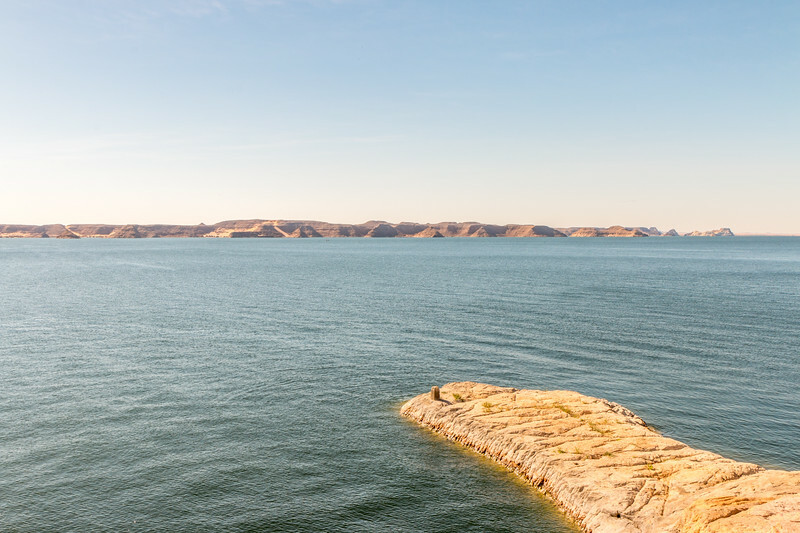 Lake Nasser was created when the Aswan High Dam was built. Today, it’s one of the largest artificial lakes in the world. The perfect backdrop for Abu Simbel temples and home to the famous Nile crocodile. 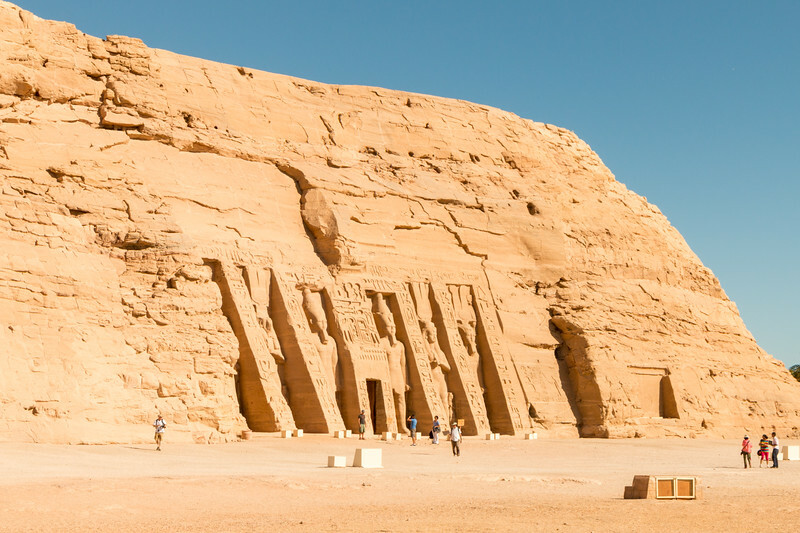 Have you visited Abul Simbel? What do you think of these temples? It is. Quite a surprise when we went there. Really impressive. You should! Egypt has a LOT of things to see. It looks amazing! I visited Egypt with my mum as a child, but back then we didn’t have the chance to go to Abu Simbel. I would love to return one day as an adult and make up for that,it looks fantastic! This is definitely one the highlights of Egypt! The current situation is bad for their economy but on the bright side, for us foreigners, it’s a great time to visit. Wow this looks incredible! I’ve never been to Egypt, but would to. Did you feel safe everywhere? It is. Totally worth it. We did feel safe everywhere. Besides people trying to sell all sorts of things, everything was very smooth. Even when walking by ourselves. No concerns whatsoever. Thank you for sharing your experiences in Egypt! We had exactly the same feeling when we visited. The hassle intensified a bit with the tourism crash but it’s mostly east to deal with albeit a bit boring when saying “no, thanks” a few times in a row. Have a great trip in May. I’m glad to see someone visiting Egypt, tourism is such a vital part of the economy and stability of the region. Yes, definitely. It’s important as a tourist to help. Stunning. I have mixed feelings about sites that have been moved, as I’m sure they lose a sense of place to some extent, but I’d love to visit the Temple of Nefertari. I wish I’d been able to see more on my trip to Egypt. It was either moving or losing the temples. As far as we can tell, it was done brilliantly. The fake mountain, same orientation. All the details were thought of. Egypt has a lot of things to see. Oh wow I had no idea that the temples had been relocated! It must have been quite an accomplishment at the time, impressive and so interesting. I guess the 4am wake up was all worth it! Totally worth it. It’s a great accomplishment and the best part is that it was possible to unite a few countries to get the job done. Egypt is classic.One of the wolrd oldest civillizations! It will always be interetsing to visit their temples and other monuments. Thanks for sharing by the way, I love you pictures. Yes, you’re right. Amazing civilization. In two weeks we saw a lot of things and we know we only scratched the surface. What an amazing site! I have always been fascinated with Egyptian history so Egypt is very high on my list of places I would like to see. Were you only allowed an hour there if the convoy left at 0400 and returned at 1100, with the 3 hr journey? That would be quite the trip for such a short time, but I’m sure it’s worth it. Why aren’t the guides allowed inside? We were allowed a couple of hours. Left at 9 am. It’s the most usual way to visit Abu Simbel. There’s also the possibility to stay there for the night which gives you more time to enjoy the site. Two hours are enough, though! They’re not allowed because of the noise and also to make people move inside in order to avoid it gets too crowded. Thanks a lot for an interesting article. I’ve bee to Iraq and Kuwait some time ago, and although there is not much left from Mesopotamian civilization, I was fascinated by it. I really would like to travel to Egypt this year. Can someone tell, if it is safe there now? I keep hearing about a dangerous situation, but at the same time some sites keep telling that tourism in Egypt is actually safe. Any thoughts on this and maybe advice? Those must have been really interesting trips! We’ve just replied to you in the other article, but just to say it again, yes we felt safe. We didn’t have problems and visited all the main sites plus a lot of others. We had a great time and felt comfortable and relaxed all the time. I was there in November, and I never once felt unsafe. They take their tourists’ security very seriously. Thank you for sharing your experience. No queues these days in Egypt! Have a great time.